Shed inches to drop a dress size, fit into those old jeans, or tighten and tone those hard to reach areas that are resistant to slimming down. Start 2017 off right with Portland Clinic of Holistic Health and Lipo-Light. Lipo-Light is a Low Level Light treatment that stimulates the fat cell to emulsify (liquefy) the fat within the cell and cause it to move from the fat cell into the lymphatic system, where it can be purged from the body more easily. A series of these one hour treatments can reduce inches form the waist, hips, thighs and other problem areas. Lipo-Light results in millions of fat cells becoming smaller, so fat is removed, inches are lost, skin is toned and tightened, and your body is transformed. 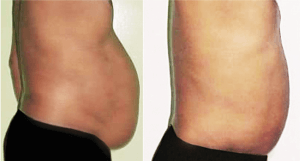 Lipo-Light is considered a safe alternative to invasive procedures like liposuction. This treatment is 100% non-invasive and causes no bruising, scarring, or swelling–In fact, there is NO DOWNTIME at all. During the treatment you will not feel discomfort and will not need any anesthesia. After the treatment, you can assume normal activities immediately. Where does the fat go? The lymphatic system is a system of lymph nodes and vessels running throughout the body that is responsible for transporting fatty acids to the circulatory system for metabolism. The lymphatic system is ‘powered’ by muscle movement. Fatty areas can become sluggish with impaired lymphatic drainage causing fluid retention, which causes cellulite. Lymph nodes release enzymes to break triglycerides down into free-fatty acids. The free-fatty acids are then used as energy for the body and burned off during exercise. If aerobic exercise is not performed following your treatment, the fat will be reabsorbed by the cells.